FAQ : How does a Blow Off Valve work? And what is its essential parts and function. We often get questions about our Blow Off Valve, how it works and about the essential parts and their functions. There are many different types and models of blow off valves, but all serve as the same purpose. Here, we review the basics, explain how a dump valve works and we go through the different parts and what they do. And, as we only manufacture atmospheric blow off valves, these are the ones we will cover here. What is the purpose of a Blow Off Valve? A blow off valve is actually a Pressure release valve that releases turbo pressure / boost when the throttle plate is closed. While the turbo is still spinning and creating pressure, a wave of pressure will travel back to the turbocharger when the throttle close, this will results in that the compressor wheel stalls the “compressor surge” and slows it down very quickly. This is hard on the bearings and decreases the turbo´s lifespan, it will also take longer time for the turbo compressor to spin up the next time the throttle opens and the turbo will not be able to deliver maximal boost as quickly as possible. There are two different blow off valves; re-circulating and vented/atmospheric blow off valves. A re-circulated BOV is one where the boost pressure is re-circulated back into the intake, in order not to affect the engine already measured air / fuel mix. A vented BOV is one where the air is released out to the atmosphere instead of being reused. We´ve chosen to illustrate the function of an atmospheric blow off valve, even if a re-circulated one have the same function but not the same design. What happens within the BOV? Engine vacuum at the top of the BOV piston is trying to force the piston to open. There is no vacuum or pressure at the bottom of the piston. A vented BOV needs to remain shut in idle state to avoid leaking. To make that possible, there is a stainless spring inside the upper BOV housing that holds the piston closed. 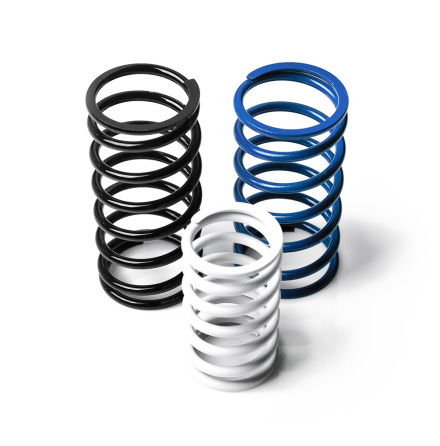 Nuke Performance offers three different springs for differences in engine vacuum in order to make it possible to optimize the setup for any engine. The conditions the BOV is experiencing at low boost is similar to the conditions when the car is in idle state, but there is less vacuum present at the top of the piston, this is because the throttle is slightly more open. If the correct spring is mounted in order for the piston to be closed at idle state, the piston will also be closed at low amount of boost. 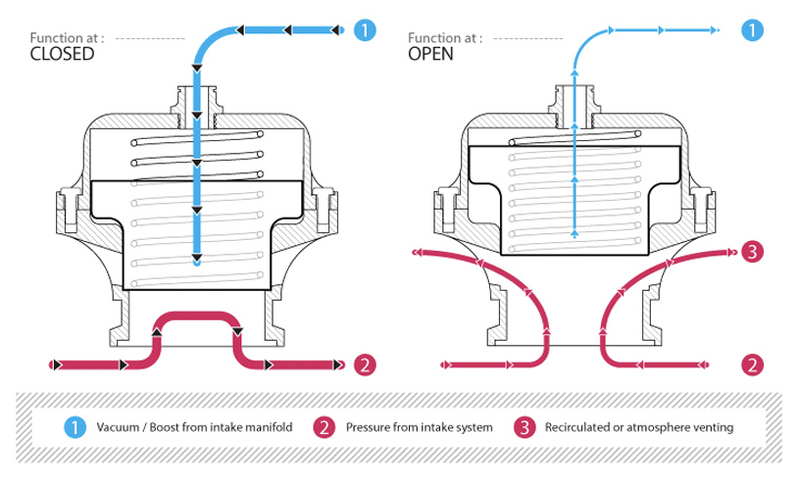 The valve is fully closed at high boost due to the boost pressure at the top of the piston. At high boost, the pressure at the top of the piston will turn to vacuum, the pressure in the intake and the vacuum at the top of the piston will force the piston up into the upper housing, making the boost exhaust to the atmosphere and prevent the turbo/compressor from being slowed down by the excess boost pressure. It is when this happens that the well-known “dump sound” occurs. How does the boost affect the movement of the piston? What are the essential parts of a Blow Off Valve? Where a blow off valve should be fitted! The BOV is a separate part that is supposed to be mounted in the intake plumbing between the turbocharger compressor and the throttle plate. What is the difference between Nuke Performance Blow off valve and a cheap copy from China etc? The more expensive BOV´s have much more engineering behind the product which aims to make it more exact and able to perform at higher outputs. It is very common that a blow off valve will malfunction, or that it does not work at all at a higher boost pressure. This is usually due to leakage or due to late / not sufficient blow off. We put a great effort in-to the engineering of this BOV in order to maintain the same high standard as all of our products to secure that it always delivers what it promises. My blow off valve is open at idle, what is wrong? For different engine setups, different BOV springs are used. If your BOV is open at idle you should change to a harder version. 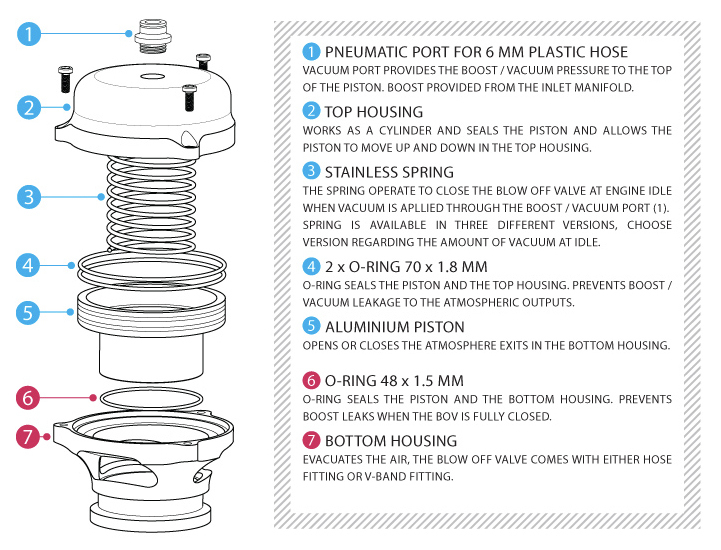 To know which spring to use for your engine setup, please see our Spring Pressure Chart. Should I use V-Band or Hose connection? The biggest difference between the V-Band version and the one for hose connection is that the V-Band come delivered with a V-Band welding flange that is used to weld to the intake piping, if you run silicon hose it is not possible to use the flange, then you use the hose connection version with hose clamp.